Our delivery teams are here to make your purchase a reality. During the sales process, your sales associate can provide an available date for your merchandise to be delivered. Up to two days prior to the delivery date, you will be contacted with a time window of when your merchandise will arrive. On your delivery date, our trained delivery crew will ensure the merchandise is carefully transported and placed in your home where you want it. We’ll remove all the packing materials and allow you to inspect your purchase to make sure you are satisfied. After you’re satisfied with how everything is set up, we’ll leave you to enjoy your new purchase. Contact your local store for additional details. Before you purchase furniture, please measure the intended area in your home to be sure everything will fit accordingly. Measure the furniture by length, width and height to determine how much floor and wall space it will need. Measure the diagonal depth and width of the furniture to determine if it will fit through your home's entryways. We will not hoist furniture or remove windows. Can your street/driveway accommodate a 26-foot truck, clear of telephone wires and any other obstructions? Will the furniture and team fit through all necessary doorways, hallways or stairways with product? Is your room ready for the furniture to be delivered, with space cleared? 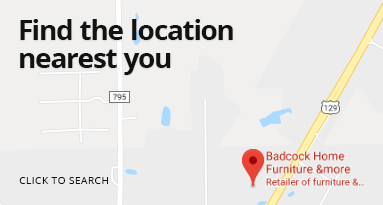 During delivery, inspect your furniture and report any damage to our delivery team. We will work to resolve the issue promptly. "Love my bedroom set and recliner! The staff was so patient and helpful and the delivery guys were fast and considerate while getting everything set up in my room. I would highly recommend Badcock to anyone!" Do you have a question about your delivery? You will receive a call up to two days prior to your delivery notifying you of a time window when your merchandise can be expected. Do I (the purchaser) have to be home during the time of delivery? Someone over the age of 18 must be home to accept the merchandise. You or your designee will have to sign stating that everything on your order was delivered and free of damage. Will you haul off my old furniture? In most cases, no. Contact your local store and ask them if this is an option. Can your delivery crew move existing merchandise in my home? Some light moving of merchandise can be performed. 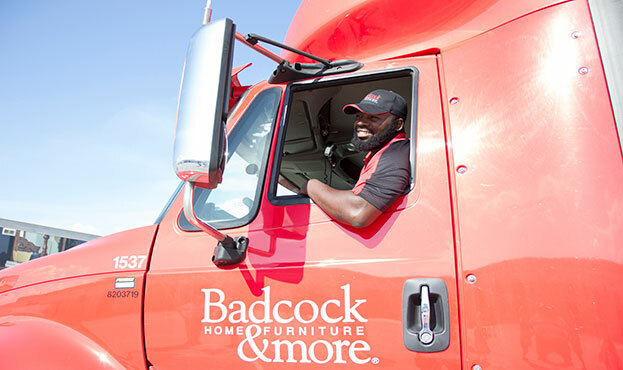 If your home is not ready for delivery, please contact your local store to reschedule. Are there things that you will not hook up or deliver? Hook up washers, dryers, or dishwashers to existing hoses, water or gas lines. Hook up icemakers or water lines in refrigerators. Carry gun safes up more than 3 steps. Additional restrictions could apply to your local store. Please ask your sales associate for details. Can I pick up my merchandise instead of having it delivered? You certainly can. Contact your local store for pickup details. Why choose delivery over pick up? Peace of mind. Our delivery service ensures the merchandise is handled correctly and placed in your home without damage. If our delivery team damages merchandise during the process, we are responsible for replacing the merchandise to your satisfaction. No such guarantee comes with merchandise that is picked up. What’s more, in the unlikely event of a manufacturer’s defect, we will be responsible for the transport of your replacement merchandise only if delivery was originally chosen on your order. Let us take the hassle out of transporting and maneuvering merchandise for you.